Our condo is located in the heart of Mount Washington Valley. Our two level unit is strategically located at the base of Attitash Mountain. Easily walk to the slopes in the winter or walk to the summer activities in the summer. This four season resort is within minutes of Storyland, Nestlenook, Mount Cranmore, Wildcat Mountain, and North Conway. Enjoy tax-free outlet shopping, golfing, kayaking/canoeing, hiking, scenic railroads, arcades, alpine and water slides, horseback riding, access to the Saco River, sleigh rides, and restaurants. Within an hour's drive to Cannon, Loon, and Sunday River! Enjoy the outdoors and all the amenities at Attitash Mountain Village. A/C in main living areas and master bedroom. Unit includes a 50" flat screen TV. Additional flatscreen in second bedroom. Our property is located at Attitash Mountain Village, a full service family resort with many amenities including indoor and outdoor pool and jacuzzi's. Saco River goes through our property with access to swimming holes, fire pits, trails and fishing. In the heart of Mount Washington Valley. Views of Attitash Mountain and the ski lifts from the living room! 4 Hot tubs on the resort. One is located at the indoor pool, one outside the indoor pool, 1 at the fitness center and one by the outdoor pool, open all year round. Unit has a 50' flat screen plasma TV in the living room and a flatscreen TV in the second bedroom. The house was cozy and clean, the beds were very comfortable. Kitchen equipment was good. The best part is the location, you can walk to the slopes, restaurant, health club and to the jacuzzi. We really enjoyed and hope to come back. Great spot, clean unit and easy to get to the lifts. Our family of 3 generations had a great time in this condo for a week. It was super to have such a short walk to the slopes and the pool. The grandkids loved it. Thanks again. Tons O Snow too for the week and a huge amount just after we left, winter at its best for skiing and boarding. Everything you see about this condo is exactly what it is. It was wonderful being at the base of Attitash and so close to be able to walk through the tunnel and get on the lifts. The use of the pool and jacuzzi's were really nice. The condo was well stocked with dishes, pots, pans, towels, shampoo and soaps etc. There were only salt and pepper for spices, so you need to bring all condiments etc. Nothing in fridge, but that was to be expected. They have games (free to borrow) and movies for rent for ($2) at the front office. The only minor complaint was that the gas stove is used to heat the whole unit. We were there in the COLDEST part of the Winter and it was a bit chilly in any of the other rooms. We had to keep the stove on full blast the whole time. But we just used sweaters and we were fine. Any other time of year would be perfectly fine. The units in the complex are older and a bit dated, but for this price and convenience, it was totally worth it! I would definitely stay here again! Thanks for the great review! As an update, we have installed a heater wall unit to supplement the main heating on the first level for the extreme cold winter days. Great condo to rent for skiing at atitash!!!!!!!!! This is a great condo to rent for a skiing weekend. We had a blast the condo had everything we needed for our ski weekend plus a large outdoor hot tub. It was a two minute walk to the slopes so no waiting for a shuttle or driving to the mountain you couldn't pick a better location. I would rent it again. Very Clean, Well prepared for guests. Despite an incredibly rainy and unusually warm weekend our group of 7 had a fantastic skiing adventure at this wonderfully kept and prepared unit. It offered exactly what was on the brochure, the pool was well kept, the linens were clean, the kitchen was well prepped, and the bathrooms were in order with guest shampoos and soaps. In my opinion we were thrilled to stay here and would do so again. And despite the only 1 day of decent skiing we got out of our weekend trip, I couldn't say enough about how easy it is to just walk over to the mountain through the bypass and just enjoy your holiday stay. Oh and the owner was a down to earth businessmen who was very hospitable when discussing the vacation. If you go up, make sure you pick 3 days at the very least here. And I hope you get good skiing weather for your trip. 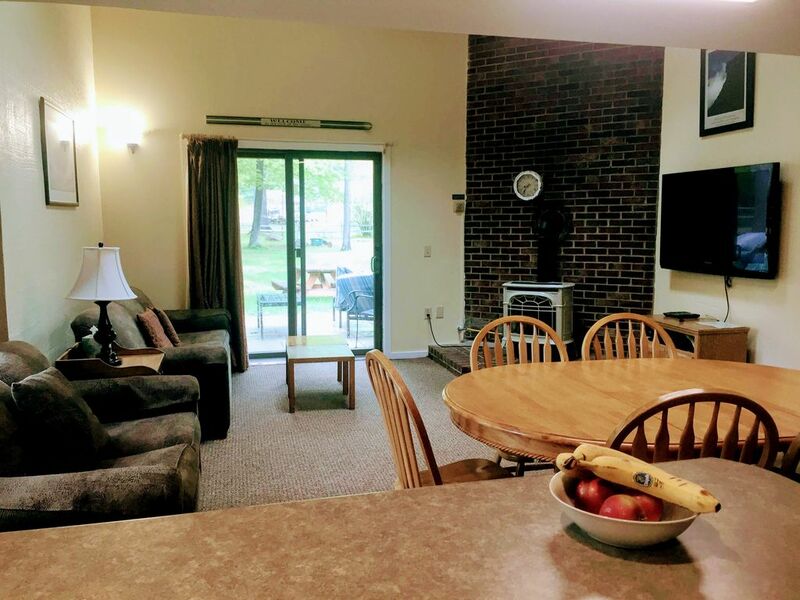 Our condo is located at the base of Attitash Mountain situated on a family resort with many activities for the entire family including a playground, pools, ping pong, walking trails, tennis courts, ice rink and arcade to name a few! Rates include all taxes, fees and housekeeping. Please contact us for seasonal long term rental rates. Please note, higher rates charged for holiday periods.